1. Mix yogurt and sugar. Mi x well and put into freeze it. 2. Mix flour, semolina, salt, oil and water together and make soft dough. Let it sit for at least 15 minutes. 3. Divide into 3 and roll each ball. Make you desire shape (cut with cookie cutter or small or big square shape). 4. Heat the pan with and fry them on slow heat till those become light golden brown. 5. Mix tamarind puree, black salt, cumin powder and sugar and keep aside. 6. 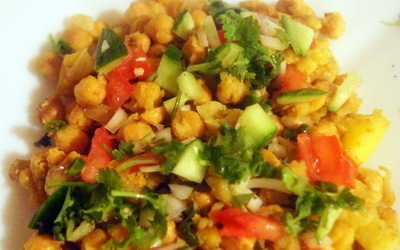 Mix chick peas, potato, half of chillies chat masala and salt and place in a serving plate. 7. Add cucumber, tomato, onion, chillies and coriander. 8. Top up with cold yogurt, tamarind sauce, papri and gram flour noodles. 9. 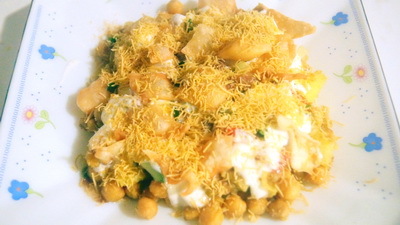 Enjoy Papri chaat straight away. 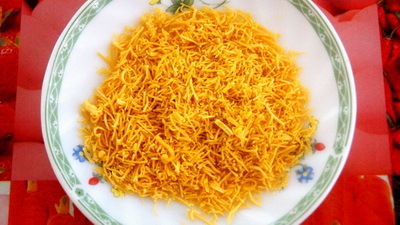 Tips: you can use dry chilli flakes in it.